Opel unions reacted angrily after a decision was delayed on German loan guarantees to help the General Motors Co. unit finance a 3.7 billion euros ($4.52 billion) restructuring plan. A steering committee of Germany's rescue fund on Tuesday did not recommend whether taxpayers should backstop loans of about 1.3 billion euros to help Opel reduce European production and labor capacity by 20 percent. Germany's Economics Minister Rainer Bruederle said a decision on loan guarantees would not come until late May or early June. Government officials claim Opel is not in any acute danger of collapse, so there is no rush to make a decision despite 18 months elapsing since the first aid request by Opel was made. The delays have raised the suspicion that Berlin is drawing out a final decision long enough until it is blatantly clear to all involved that the answer will be no. "While all other countries in Europe affected have long since decided (in favor of aid) for Opel, the German government economic policy is still spinning in circles," the regional union boss from IG Metall Frankfurt, Armin Schild, said. He warned that the federal government in Berlin risked complete isolation both in Europe and in Germany, after regional states with Opel plants such as Thuringia as well as the UK, Spain and Poland had decided to provide aid. "The dithering and the haggling of Bruederle is unbearable," said Dietmar Muscheid, the head of German union umbrella federation DGB in Rhineland-Palatinate, home to Opel's Kaiserslautern plant that supports 3,300 jobs in the state. Money-losing Opel is seeking state aid for its turnaround plan that will see the loss of 8,400 of the unit's 48,000 workforce and production reduced by a fifth, including the closure of a factory in Antwerp, Belgium, to bring capacity into line with lower demand. As a 100 percent subsidiary of GM, Opel says it does not have access to credit lines, since it has no debt rating of its own. GM only wants to contribute half of the 3.7 billion euros Opel requires in total funding through to 2014, saying that since Opel is a European carmaker it is a problem for European taxpayers. Germany, where Opel is based and half its workforce is employed, is being asked to provide the lion's share of aid but Berlin has been cool to the idea of funneling taxpayer funds into Opel after GM abandoned a sale of the unit to Canadian supplier Magna International Inc. that the German government had helped to arrange. A final ruling on aid is likely to be made by senior members of the German government, in conjunction with the four states home to Opel plants. As many as 120,000 jobs in Germany including those at suppliers and dealers will be affected by any decision. Thuringia's state economics minister, Matthias Machnig, who represents voters working in the Opel's Corsa plant in Eisenach, called on Berlin to act. "Bailout packages in the billions for Greece and the financial sector are agreed for in a matter of days, while decisions affecting jobs in the real economy are repeatedly postponed," he said. The state, which is in the structurally weak former East Germany, has promised to offer 27.2 million euros in guarantees to the displeasure of the three other states that wanted to continue to act strictly in unison to maximize their political influence. Adjusted for restructuring charges and a one-off gain from the sale of Saab, GM Europe - which effectively represents Opel - posted an underlying loss of $324 million in the first quarter. Losses are likely to be higher over the course of 2010 because Opel will book the bulk of its 1 billion euros in restructuring costs in the second and third quarters. 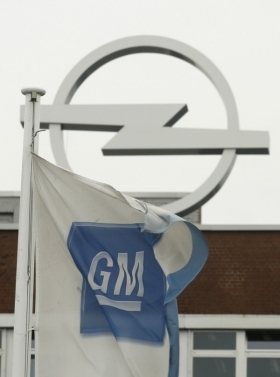 GM has said it will not let Opel fail and has $21.6 billion in net cash to fund its global operations. The GM group overall generated $1 billion in cash in the first quarter alone, which could be used for Opel without tapping U.S. taxpayer funds.